And see the cycle (I'm working on it!). Lucky for me, several theaters have been mounting the cycle with Red Bank's Two River Theater even committing to mount all 10 plays.To cross another play off my list, I recently traveled down to Philly's Arden Theatre Company to see my 7th play of the cycle - Gem of the Ocean. 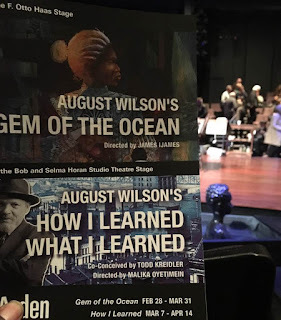 And what can I say - Bravo to Zuhairah for literally bringing Aunt Ester to life before my admiring eyes and inviting me into 839 Wylie Ave. And then thank you for taking me on an uncomfortable painful journey on a slave ship (I honor every African who lost their life during the Middle Passage). Terrence McNally joined by Audra McDonald and Michael Shannon at TimesTalk. Frankie and Johnny in the Clair de Lune, which begins previews on May 4th, was not on my Broadway "must see" list this season. However, after the TimesTalk, I may have to add it to the list. Interesting bit of trivia -- Frankie and Johnny is the first Broadway production to use an Intimacy Director. Wow, just enjoyed two weekends celebrating African American voices. First, the National Symphony Orchestra with Cynthia Erivo at the Kennedy Center. Then, Soundtrack of America: Night 4 - a concert series celebrating the influence of African American music with a new generation of groundbreaking artists. Soundtrack of America was conceived by filmmaker Steve McQueen after filming 12 Years a Slave. Standing in Congo Square, the birthplace of African American music, McQueen wanted to know more about the music and with no museum or other place to go, he gave us Soundtrack of America. First up, the National Symphony Orchestra joined by Cynthia Erivo singing some of her favorite songs at the Kennedy Center. What a special treat hearing Florence Price's Finale from Symphony No. 3. Unknown to me, Florence Price is the first African-American woman to be recognized as a symphonic composer, and the first to have a composition played by a major orchestra (the Chicago Symphony Orchestra). Quote from August Wilson's "Jitney"
That white man ain't paying you no mind. You ought to stop thinking like that. They been planning to tear these shacks down before you was born. You keep thinking everybody's against you and you ain't never gonna get nothing. I seen a hundred niggers too lazy to get up out the bed in the morning, talking about the white man is against them. That's just an excuse. You want to make something of your life, then the opportunity is there. You just have to shake off that "White folks is against me" attitude. Hell, they don't even know you alive. Love this video that popped up in my FB feed. Eleanor Davis in "Why Art?" Not all art should be categorized aesthetically. Many artworks are primarily intellectual, and can be categorized by either the intent of the artist or the response of the audience. Everybody deserves to have their story fully told. I write about the people I love, or that I'm curious about, and I'm going to investigate those people...If I don't get them right, if I fail them, or over-explain them, I'm doing them a disservice and it feels unfair.